I catch a lot of flak over my tv and movie boyfriends. Especially because when you watch tv or movies with me, it's generally because there's a cuteboy involved, and I'm generally grinning like a Cheshire cat, with the cooing in a high-pitched tone, "Eeeeep, that's my boyfriend!!!" The funny part is that on the whole, most of the boys I love on screen wouldn't be able to live up to every trait I've imbued them with in my head. Which is yet another reason I don't really want to ever meet George Clooney or David Tennant or John Taylor. I want to preserve the mystique. Oddly, even though I love the metroboys on screen, my tastes in real life generally run to macho men (good grief, does anyone ever really say that nowadays? what am I, a refuge from Kotter's classroom? ), but basically the guy's guy. The big and burly, rough and tough, get the job done, with just a touch of class and a little more (secret) sensitivity, and a whole lotta lovin' for his woman. 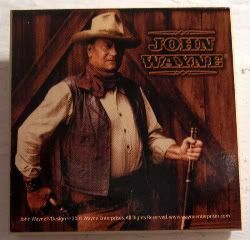 Think John Wayne in McClintock! or Hatari! I don't care how sexist and girly this sounds, but I swear I fell for a (gentle giant) guy once just because I overheard him ask my (Amazonian) roommate where "the little one" was...that's just how big and burly that guy's gotta be. And, yeah, I just basically described any romance book in any time period. I know. I'm nuts, but I grew up on those romance books, so I have to believe that they exist somewhere. Never mind that I once had a romance author tell me, "Joy, you know we just make them up, right? They're not real?" Oiy. Yes. They're real. Otherwise, they wouldn't have made magnets of them.